There are decades of solid research and scholarly articles about why third grade retention is not only not beneficial for students, but is, in fact, harmful. Therefore, if a student has no documented reading deficiency, it is even more obvious that no one is served by retaining a child simply because they are lacking a single test score. Not teachers, not schools, and most importantly, not the student. The opt out movement seeks permanent change for all children, with research-based decisions. Third Grade retention goes against all accepted scientific research about the best practices in education. And yet, as the school year has ended and satisfactory report cards have been sent home, many third grade students across Florida, whose report cards proved them proficient, but whose parents opted them out of testing, have been either retained (here, here and here), scheduled for summer school or further testing (SAT10, IOWA) before their districts will promote them. These children minimally participated in the FSA by sitting for the test, but did not complete the test and received no test score. Throughout this post, I will refer to “portfolio tests” and “student portfolios.” This is an important distinction. The state has seen fit to “help us” by creating a bank of test items, which they call a “portfolio” (don’t forget the air quotes). That is not a portfolio. It is a series of tests (in some cases as few as 15 in Seminole or as many as 42 in orange), which cover the requirements to meet the required standards. Some districts have promoted students without test scores (see here), confident that the children’s (satisfactory to excellent) report cards are evidence that they met the required standards to prove their mastery of third grade. Some children are in retention limbo, waiting for their districts to make final decisions to promote them or to continue this farce of retaining proficient children. Other districts, having foreseen this exact predicament, administered the state’s portfolio tests, some from the beginning of the school year, and were able to satisfy the good cause exemption from retention. Still other districts administered the SAT10 or the IOWA, post-FSA, both with and without parental knowledge, and promoted some of the children. Parents, who opted out of the Third Grade FSA are testing the system and have also refused all manner of standardized testing. They are demanding that the districts promote their children based on their work, done throughout the school year. These courageous parents are not afraid of tests. A portfolio may contain many different kinds of tests and assessments done throughout the year. They object to the standardized tests which are used, not in service of their children’s education, but for the data used to rank and sort their children, teachers and schools, adding to the culture of incessant test prep which eats up valuable instruction time all year long. They object to promoting (or retaining) their children by a single test score, which denies teachers’ professional integrity and their children’s hard work. Reliance on a single test score denies the worth of a year of teaching and learning in the classroom. Children with no FSA scores and NO reading deficiency are STILL at risk of retention. Many of us in the opt out movement believe strongly, that without evidence of a documented reading deficiency, a report card should suffice to promote a child from the third to the fourth grade. Most school districts either don’t agree, disbelieve this or they dismiss it. From our perspective, the only acceptable alternative assessment is the assessment of a student portfolio – a collection of a student’s independently completed work from the classroom, done throughout the school year. In the absence of an FSA score, and in spite of having administered the IOWA twice in the year, Seminole County remains adamant about using only the SAT10 or the state’s portfolio tests for good cause exemption, instead of an actual portfolio of independently completed work, which, if the standards have been taught in this stellar district (7th out of 67 districts), all students should have. There should be no reason why the work would not match the standards. This is in addition to Accelerated Reader, used to derive Lexile scores and all of the computer adaptive competency-based online tests, such as iReady and SuccessMaker, among others. 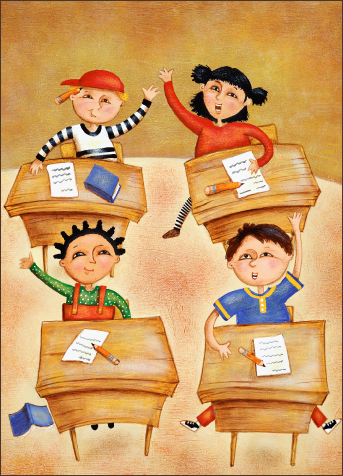 Why insist on the portfolio tests, which is really just MORE testing, about which teachers have said repeatedly that very few third graders can pass because they are above grade level? If schools are teaching the standards, a student portfolio would be proof that required standards are met. What reason then, could a district have for not using such a portfolio? If a teacher is not meeting the statutory requirements from their unit assignments or chapter tests, this begs the question: Why not? If a teacher does not have at least three pieces of evidence of students’ mastery for each standard, what is the teacher doing? If a teacher is concerned that the assignments they give through the year may not satisfy this requirement, that’s another question entirely. If a teacher says: “This is too hard” or “This is more than what I’m doing”, we can respond by asking: “Then, what exactly, ARE you doing?” Remember, our teachers are teaching the standards. And if they are not, that is where the Principal comes in. That’s a conversation to be had with the Principal and the Teacher. The assessment of a student portfolio is, without question, the best test of a teacher’s and a district’s accountability, which is what the opt out movement supports. The student portfolio is the best evidence of a child’s work, on good days and bad, under the guidance and direction of a trained professional for all 180 days in school. When parents opt out of allowing the FSA to be the sole determiner of their child’s fitness for promotion, they entrust the authority of assessment where it belongs: in the teacher’s hands. “What’s happening in third grade and throughout the state is we’re devaluing our teachers in third grade by saying it really doesn’t matter what you think, it doesn’t really matter what you say if they fail this test,” MacIsaac said. The opt out movement is the strongest grassroots advocacy movement supporting teachers’ professional autonomy and authority, stronger than the PTA (where’s the T? ), stronger than the two national teachers’ unions (NEA and AFT), which, in the past, have repeatedly avoided partnership opportunities to defend their own teachers’ classroom authority. Many teachers don’t even realize that this movement supports them, nor do they clearly understand how we do so. 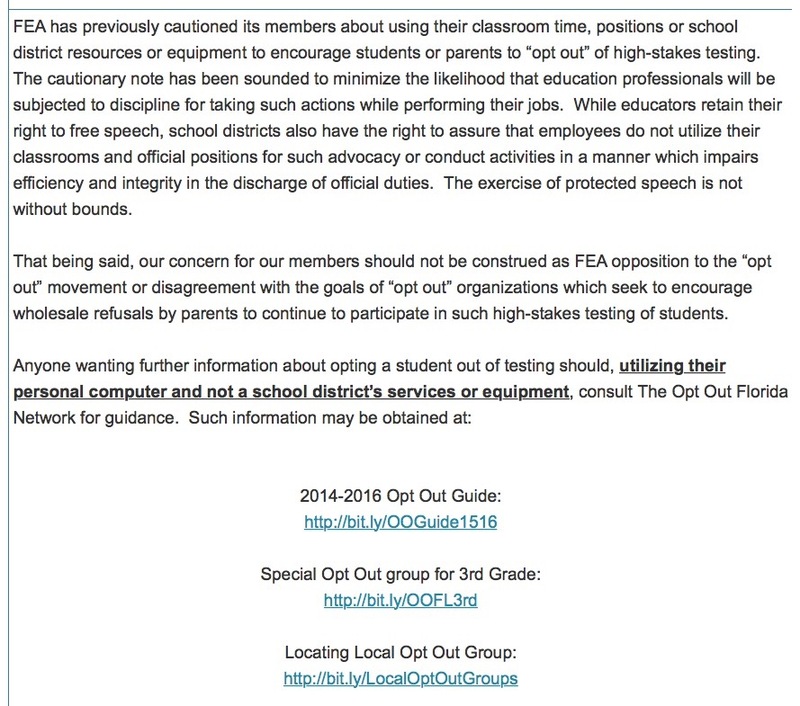 This is a reminder that the Florida Education Association has posted informational resources from The Opt Out Florida Network on the FEA website for teachers (also here). Florida statutes and the Oct 24 2014 Student Progression Technical Assistance Paper both state that parents can choose a student portfolio as an alternative assessment and that a student need only pass ONE assessment to be promoted to the fourth grade. 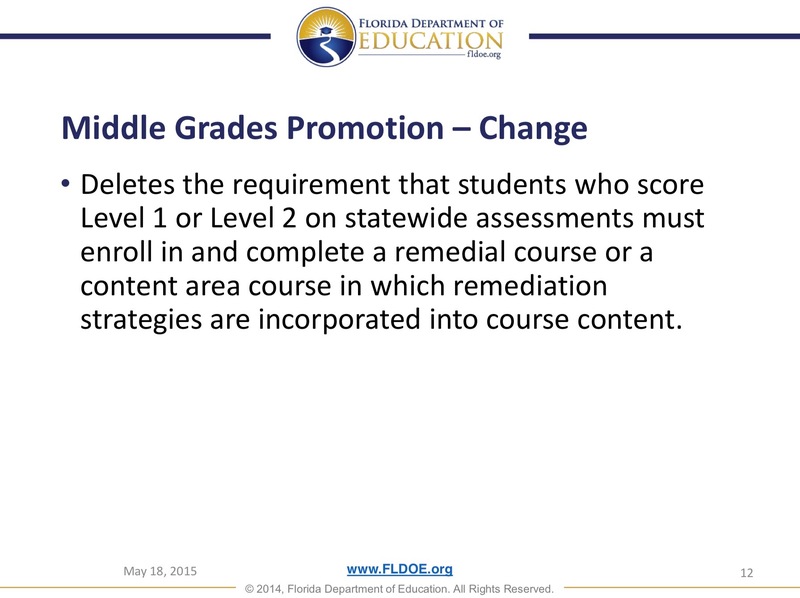 Nothing in Florida statute or the Student Progression Plan states that parents may/shall/must be denied the option to use a student portfolio as a good cause exemption – for any reason. AND the FLDOE has said there is no hierarchy of good cause exemptions, therefore, none is more or less valid than any other. The FSA validity report said that the FSA does not fully align with all the required standards. (The DOE did counter by saying that almost every question did match a standard… just not necessarily the one it was claimed to match.) Since the requirements for a student portfolio do match the standards, a satisfactory student portfolio actually exceeds the standards tested by the FSA. 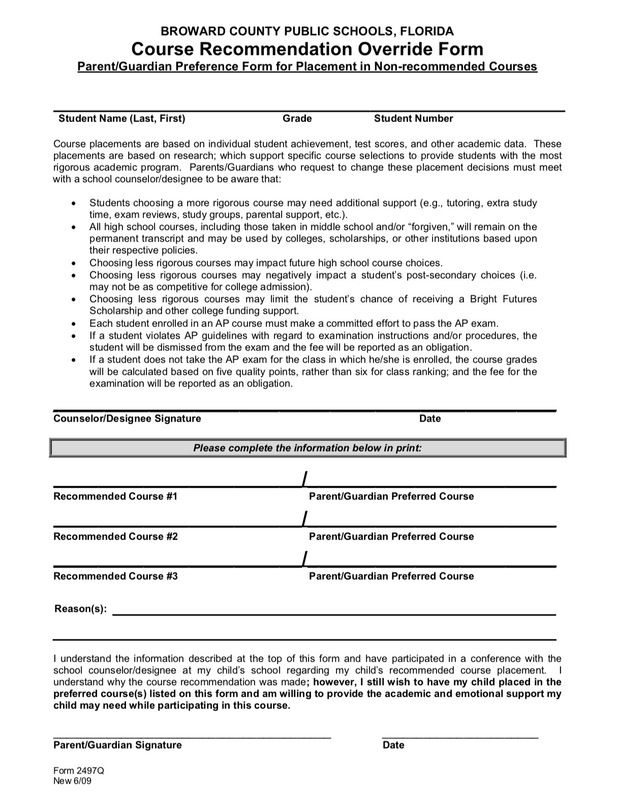 A student portfolio is superior evidence of a student having mastered third grade requirements. Be signed by the teacher and the principal as an accurate assessment of the required reading skills. Additionally, note that the Just Read, Florida! Office has begun creating an updated Third-Grade State Portfolio. B-8. Can grade 3 English Language Arts items from the Florida’s Item Bank and Test Platform be used as part of a student’s third-grade portfolio for good cause exemption or mid-year promotion? Yes. Items used in a student portfolio must meet the specifications stated in question B-3 Rule 6A-1.094221, F.A.C. NOTE: B-8: “…part of a student’s third-grade portfolio…” School districts have mistakenly turned Florida’s Item Bank and Test Platform (a series of tests) into the entire “portfolio.” This is a mistake, it’s lazy and parents should not accept this. A student portfolio and portfolio test items are not interchangeable, nor were they intended to be. There is nothing in the state statutes, which supports having to use the state’s portfolio tests over a student portfolio. AND – Parents have the right to request it. No district can legally deny that option to parents, if it is requested. “At our last board meeting, several weeks ago, there were some comments made that implied that… parents were harming their children by having them minimally participate and not take the FSA. And I just have to defend those families. It’s their choice to send their child to public school to begin with; their choice to have their child participate in all the different things we offer. I understand that in the Third Grade, state requirements says that they have to take the FSA, but there are other options. If you read the statute, there’s are other options. There’s a portfolio statute, that you can start at the beginning of the year. Up until recently, it used to be that the portfolio was really there for teachers, for students that they felt wouldn’t be promoted, because they might not pass the test. But through this little bit of crisis we went through, going back and forth like Mr Katz said, where the DOE threw the school boards, the districts under the bus, through that, I think we’ve all determined, if you really read the statute for what it really says, and it’s very clear – The teachers CAN choose the portfolio items that they want their students to have. And we’ve found that some of the teachers did a really great job of providing the proper work. When several of those families came in (I didn’t work with every family. I only worked with 8 that came to me. There were some that already been worked with through the same dept.) They came in and their work was so phenomenal that they just went tick, tick, tick, tick and met all the standards. It was really phenomenal. Some schools have said that they are not allowing the use of a student portfolio (not portfolio tests) because it is too time-consuming for the teachers. Some have said that the work alone does not show clear evidence of having met the standards. If the standards are what are being taught, then this should not be possible and that is not a problem solved by more testing. Numerous teachers, including my children’s teachers from years ago, have stated that creating a portfolio as the work is done, is really just a matter of marking the standards required and assessed in school and saving the work in a simple folder. Social Studies and Science can be used to cover the informational text requirements. Compiling a portfolio is not new and it is not rocket science. This doesn’t have to be a complicated process. Parents need only request early on in the school year, that a portfolio be maintained because there is a risk that their child may be retained, and they need to request to examine the portfolio from time to time. This is necessary because in numerous instances, parents have been told that a portfolio was being maintained at their request, and then too late, found that it was not the case. Parent and high school teacher, Joshua Katz spoke compellingly at the same board meeting and addressed the fact that his daughter, Abigail was promoted to the fourth grade without a test score by using a portfolio as her good cause exemption. Wouldn’t a portfolio be a far more authentic, effective and informative assessment of a student’s progress than a one day snapshot? It would certainly provide immediate feedback for teachers and students – and it is there for immediate reference. Three years ago, when my son was in the Third Grade in Orange County, I quietly asked my son’s teacher at the start of the school year, to maintain a portfolio because I would not be allowing him to take the FCAT. She said that it was no problem as she had already started a portfolio for a few students in the class, who she felt might be at risk. She was kind enough to ask if there were any other tests I wanted him not to take. I opted him out of iReady, AR and benchmark testing. I remember being concerned that there might not be enough “data” to promote him. A veteran Third Grade Teacher reassured me that there wasn’t any “data” that could be gotten from the online assessments, benchmark tests, etc. that my son’s teacher wasn’t able to get in the course of the day. She further reassured me that the data the teacher would get would be higher quality data, with which to immediately inform her instruction of my child. My son was promoted without incident. There was ample evidence of his mastery. Because his teacher knew that he would not be taking “the test,” she was free to really teach him outside of the test prep box… and he was free to really learn. Authentic Assessment Toolbox Jon Mueller. Professor of Psychology, North Central College, Naperville, IL. Portfolio – Definition from The Glossary of Ed Reform. Seriously, take a look. Promoted to 4th Grade… Without a Test Score. Many parents and teachers believe that Florida Statute says that without a documented reading deficiency, a satisfactory report card should suffice for promotion from third grade to fourth. Retention is (supposed to be) a remedy for a reading deficiency (not punishment for opting out). Although it shouldn’t be, promotion to the Fourth Grade in Florida can be a mysterious thing. If there must be an assessment used to promote a child, then a portfolio is the assessment of choice. At yesterday’s Orange County Public Schools board meeting, Joshua Katz addressed the successful promotion of his daughter to the Fourth Grade – without a test score. That’s right. 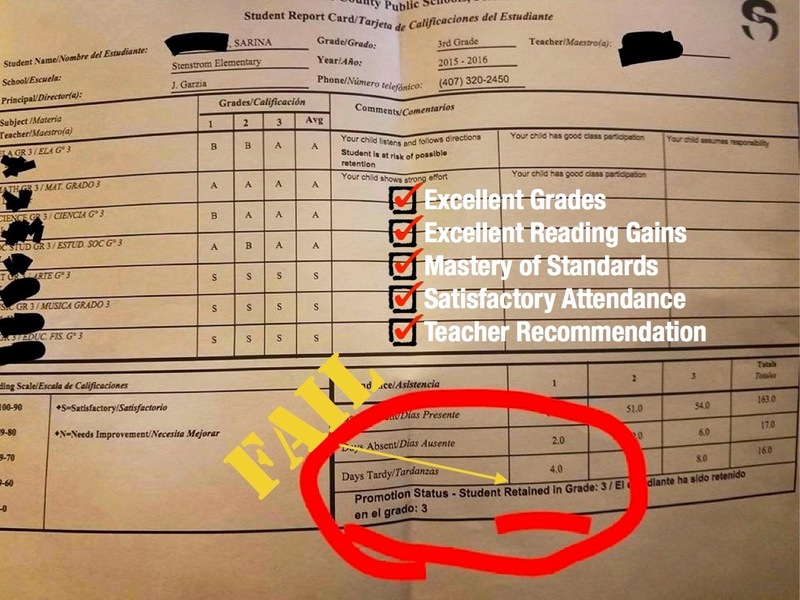 A third grader in Orange County, Florida was promoted to the 4th grade based, not on any standardized test score, but on a portfolio. A real portfolio, however… that’s officially a thing. A good thing. I would then allow everything that is good and right in education to work, and I would fight against anything wrong in education. Abigail just completed her Third Grade year with a straight A average (and straight O’s too). She knows full well what we all know: that the Florida Standardized Assessment Program has no place in this process we were born with: to learn and have fun doing it. On the evening of the last day of school on June 8, after several attempts for closure at an earlier time, I received the phone call and the e-mail that Abigail was to be retained in the Third Grade. And I was ready. And then, two weeks ago, the Florida Department of Education (as they threw the school districts under the bus) made it crystal clear that we, the parents who have been fighting for the past three years, were not the ones interpreting state statue. The parents that have addressed you over the past few years, and especially over the past few weeks, have NOT INTERPRETED state statute. We simply READ them. They are CLEAR to us. It has been the DOE, it has been the districts, and it has been the schools that were INTERPRETING the state statutes all along, NOT US. For example, I had tried unsuccessfully all year to convince the teacher and principal that a “teacher-created portfolio” actually existed. The district even discounted this truth until the DOE reaffirmed it recently. And even though the statute clearly says it is signed off by the teacher and the principal (see page 6, B-3, 5th bullet point), I was still communicating with upper level district administrators regarding Abigail’s classwork for the year. Even to the very end, it was not me interpreting statute. I simply read it. It is clear. And now, because of the hard work of her teacher, the patience of her principal, a few special people here tonight, and because of our commitment to Justice (just read any e-mail I send), Abigail, my Straight A Student, who LOVES LEARNING, and fights for what is right in education, is to be promoted to the 4th Grade. It took a lot of back and forth, it took far too much stubbornness on my part, but we did it. This fight has enabled me to give my children something that not many of my colleagues, leaders, or other adults have: COURAGE; the courage to fight for something that is right. I will continue to fight for what is right in education, protecting a student’s love of learning, protecting the teacher’s professionalism and authority, and I am extremely proud that my children are fighting alongside of me. Hey, Third Grade Opt Outers! We still want your data to rate your teachers. Don’t give us your crap excuses, You didn’t cut the mustard! SAT10 for you… THIS week! 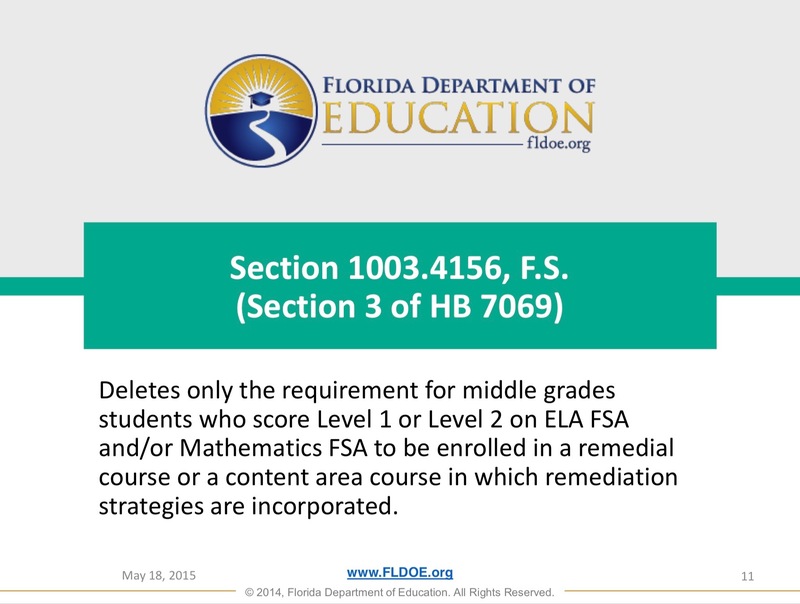 Last week, school districts in Florida began releasing Third Grade FSA scores. Then almost simultaneously, an odd thing happened. Some who opted out, were told they had failed, when, in fact, they had no score at all. This just goes to show how misinformed schools are about testing policies – and how quick they are to disseminate bad information, without verification. We are already seeing that Third Graders who opted out ARE being promoted WITHOUT alternative assessments. This underscores that it CAN be done. Informed parents have been courageously withstanding the pressure to allow their children to take the alternative tests. Their children would more than likely pass these tests. The issue is less about the test itself, than that further testing is completely unnecessary and unwarranted. Subjecting children to further testing in order to declare them fit for promotion goes against everything we fight for – an authentic education. It negates the student’s body of work for an entire year, a teacher’s time with the child, all the teaching and learning that has happened over the course of a year and reinforces that a single test score is all that counts. And we cannot support this position. Third graders without a reading deficiency should be promoted on the same basis as a Fourth grader is promoted to the Fifth grade. The threat of retention was meant to apply to students WITH a reading deficiency. There is nothing in Florida Statute to inform the promotion decision of Fourth graders or Fifth graders… The same goes for Third graders without a reading deficiency. If there is no threat of retention, there is no need for a good cause exemption to justify promotion. Parents may insist that the report card be used for promotion decisions. They should insist on that. It is the tool, which schools use for documenting progression and promotion in all other grades and indeed should be the tool used for Third graders without reading deficiency. If your child is a good reader – and if you trust that their report card correctly represents a year’s work – and is a better measure of your child’s fitness to be promoted to the Fourth grade, than a test score on a single test, then YOU, as the parent, will have to decide if you will allow your child to be subjected to still more testing, just because your district says so, even though the law does not require it. In the absence of an FSA score, which the state says, is not the sole determiner for promotion, by demanding another test score, is your district saying that your child’s work for the entire year counts for NOTHING? If you opt out of the alternative assessment (SAT10 or IOWA), the school will be forced to use the actual record of your child’s body of work for the school year. If your child takes the SAT10 or the IOWA, and fails it, this will provide your school with the documentation to retain your child in the third grade – the same as a failing score on the FSA. If your child takes the SAT10, IOWA, or the “portfolio” tests and passes, your child will be promoted. However, you will also have relinquished your child’s data to the system, by which to rate and rank their teacher, perpetuating the high stakes attached to testing, which is, hopefully, why you opted out in the first place. Parents can choose to stand up to the bully districts and opt out of the alternative assessments, which are not needed to prove grade level mastery. If your school incorrectly insists that your child must be retained, this could provide a valuable opportunity to test the system. IF your child does NOT have a reading deficiency and the district insists on retaining him/her, you can request every single piece of data from this year. That data could be evaluated by someone other than the district for proof that grade level mastery has been obtained (see “Actions of Last Resort” below). IF the statement can be made and proven that your child is NOT deficient, retention would seem to violate his/her right to a free and appropriate education, as your child would be unable to grow to the next grade level, as that has already been accomplished… your child would be forced to stagnate by district decision and that would be inappropriate instruction. WHEN school districts realize the quicksand they’re in and CORRECTLY promote the children, with NO deficiency, AND with NO FSA score, you may help to set a precedent, by which other districts can see that children ARE in fact able to be promoted, based solely on the basis of a satisfactory report card. Already, children, whose parents opted them out, are being summoned to the SAT10 or the IOWA test – and some parents are seeking legal counsel, because districts are saying, essentially, that they are prepared to retain children with NO documented reading deficiency. Parents have leverage now. If districts retain kids without a reading deficiency, parents can take this fight to the next level and force a decision in a court of law. Parents have the ability to be the game-changer. It is ALWAYS your option to withdraw your child from school at any time and register him/her as a homeschool student. If you are confident that your child has mastered the Third Grade, you can compile a portfolio of all of your child’s work for the year (you may need to get some classwork from the teacher) and have it reviewed by a certified teacher (we can help you to find one). Gather ALL of your child’s work, and organize it in a 3-ring binder, in date order, separated by subjects – ELA and Reading, Math, Science and Social Studies. THIS is your child’s portfolio, NOT the 42 separate and secret mini-FSA-tests that the state calls a portfolio. If the portfolio is satisfactory, the teacher can certify your child as having met the requirements for the Third Grade. Your child would then be promoted to the Fourth grade and you can then register your child in the Fourth Grade. If your child attends a magnet or a charter school, withdrawing your child could relinquish your child’s space at that school and there is no guarantee that you could re-enroll there. Although testing season is just about over, you can find local help and support in these groups. Get informed and organize with us as we prepare for next year! What I believe most parents are in agreement about, is that school is no longer a place where children feel emotionally safe. They don’t feel safe being curious, creative, or daring. Failing, instead of being an opportunity to learn what doesn’t work, opening a window to other possibilities, has become a label to be feared and dreaded, because there is too much at stake to allow children to fail at anything anymore. Our children don’t always feel emotionally safe just being kids in school. – I would re-engage my creative talents to tailor this year’s goals in the most appropriate manner for each of my students … and to once again make school a place of adventure, warmth and consistency. – Listen longer to the children and let them tell their stories of life. – I will do more hands on projects they will really remember when they get older! – I would do more music, poetry and plays. – Get back to creative teaching and allowing my students to enjoy learning! The teachers’ responses are poignant and, I believe, are the heart of why so many parents fight so hard in the opt out movement. We grieve this version of school as a critical loss for our children, especially if we remember loving school and loving learning. We know that, for the most part, the way our children experience school, is but a shadow of what teachers imagine here, or of what we remember fondly. I read this post with my eleven-year-old daughter. She is now in the sixth grade – a middle school student, with all that that implies. She is a typical tween – sweet, moody, sensitive, sour, dour. Yet, having been exposed to and engaged in my activism for years, she is also not your typical tween. She is mature, strong, strong-minded, informed and she has always taken her education very seriously. In our family, we ask hard questions, and we listen to each other. 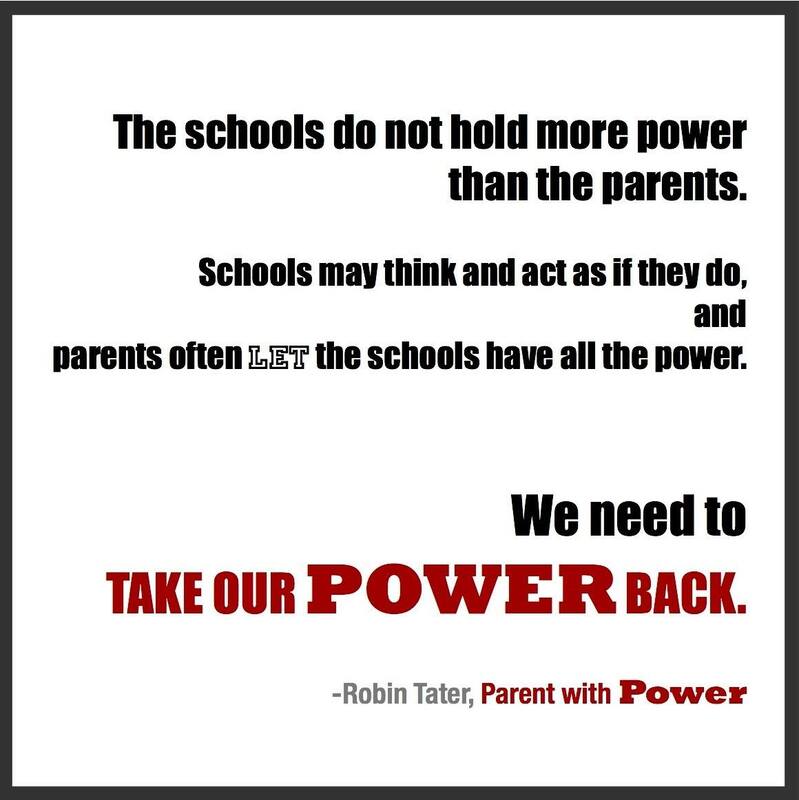 Our family has recently moved from one school district to another, where the testing culture, although a part of public education as we know it, is tempered with more compassion for children and where the district leadership seems to be more willing to listen and respond to the concerns of parents. It isn’t perfect, and there is still much work to be done, but for us, school is better than it has been for years. “I agree with all of that. School isn’t like that for me, but I wish it were. School was great until third grade. But when I was in grades three, four and five, I felt like when we went over material, we were supposed to understand it right away – even if we didn’t. I never felt like I could ask questions because my teacher might think that I wasn’t paying attention, or that I wasn’t able to understand it at all. We never had time to just talk about stuff. We always had to rush on to the next thing. It’s better now at my new school, but they still talk about THE TEST. It’s not like your friend wrote, or like you tell me school was like for you, Mom. The same thing the teachers say they want, that’s what I want too. Maybe I’ll ask my teacher why school can’t be more like your friend wrote. I wonder what my teacher will say when I tell her I’m opting out, that I’ve never taken THE test… because I want school to be like that. School CAN be like this again for all children… It’s up to us now. No fear… No doubt… OPT OUT.